No visit to Bangkok would be complete without visiting Wat Pho. 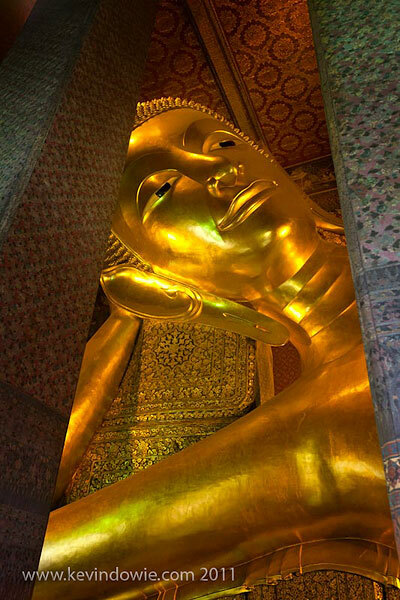 There are several points of interest, chief among them being the reclining Buddha. The figure is huge, stretching out in its classic reclining pose, so much so that it’s a challenge to photograph it in its entirety. In this instance I decided not to try and get it all in one photo but to go vertical and just concentrate on the face. 2 comments to Reclining Buddha, Wat Pho, Bangkok. Thanks Chip, I’ll search my archives for pink elephant shots! Hope you’re on the mend after your recent health issues.